This radical machine is based on a 1966 Mustang created by Gary Myers. Originally a six cylinder, this beast now has a 393 c.i. big block Hemi shoe horned into its engine bay. Not content with big cubes,Garywent further by installing, not one, but two 8/71 blower casings on top of the donk! While the bottom blower has the full 8/71 internals, the top blower has 6/71 internals in order for it to perform as a drivable vehicle. This all rests on a full tube chassis that runs the length of the car as well as inside the interior as a roll cage. A fully fabricated firewall, transmission tunnel and huge tubs to accommodate the 18.5 inch Mickey-Ts make up the floor plan and have the same meticulous detail as the rest of the street machine. The huge tunnel is home to a twin 3 inch exhaust system and 3 inch tail shaft that runs down to the Romac parts filled nine inch diff held in place by a four link rear end while the fuel, brake and air lines are housed inside the car along each side of the tunnel. The whole ride is supported by an airbag system that sees it sitting low when on show. The fully fabricated front suspension utilizes twin A-arms pivoting on rose joints. The custom details don’t stop there, the roof has been chopped, side glass removed, door handles and mirrors shaved and the boot hinges have been reversed. Inside the Stang has been given just as much attention with a full custom interior utilizing a much modified dash from a 1991 Mazda MX-6 while three carbon fiber Autometer gauges make up the gauge pod. 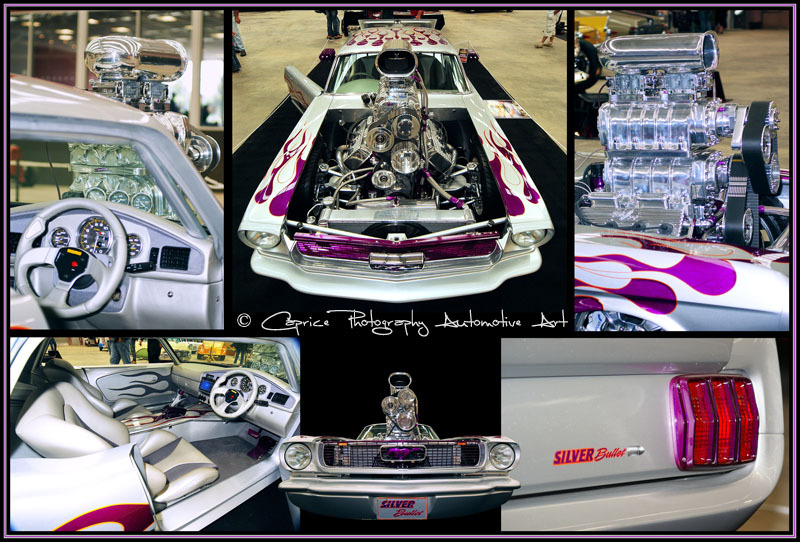 The whole car is coated in House Of Color silver complimented by dual layer flames which were a real pain to get right according to Gary, but persistence has seen the project come together to make up one unique and wild looking elite show car that draws a crowd where ever it goes!